Notary of Orlando is a Wedding Officiant, Mobile Notary, and Certified Signing Agent service. We have a passion for helping people. That is why Notary of Orlando was created. We have over 20 years of experience serving Central Florida and the surrounding area. As a Wedding Officiant, Sue is an Ordained Minister and a Florida Notary Public. Sue cares about her couples. She understands the stress of wedding planning. That is why choosing the right officiant is so important. Sue is becoming one of Central Florida's most popular officiants. She offers services for various faiths, denominational and non-denominational ceremonies. Sue also offers spiritual and civil ceremonies, vow renewals, and same day elopements. We offer high quality service at an affordable price. As a Mobile Notary, Sue offers mobile services for general notarizations. She can notarize any legal document and can provide notary forms when needed. She meets with her clients when and where it is convenient for them for a worry and stress free service. She takes special care with elderly clients to make sure they understand and are comfortable with any documents they are signing. She also offers I-9 verification services, however, this is done as an Employer Representative. I-9's do not need notarization. As a Certified Signing Agent, Sue is a Notary2Pro graduate and an NNA Certified Signing Agent. Sue has been doing loan closings since 2010. She has experience with many real estate loan transactions. This includes, but is not limited to, Purchases, Refinances, HELOC's, Reverse Mortgages, FHA & VA Loans, as well as Loan Modifications. Sue prides herself on being professional, courteous, punctual, and detail oriented. She strives to complete each assignment with integrity and without error. All documents are checked before leaving the office and double checked before Ileaving the closing. The document package will be returned the day of closing, given the closing ends before the last pick up for your preferred method of shipping. Our goal is for all parties to have a positive and satisfactory experience for their closing. We have a clear background check through the NNA and are bonded and carry E&O insurance. We cover Orange, Seminole and Osceola Counties, but will travel to the surrounding counties for a minimal travel fee. To set up an appointment, please call us at 407-494-4736 or if you prefer, please fill out our Notary Form and someone will get back to you as soon as possible. 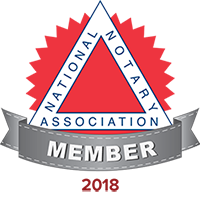 Are you in need of a Notary or do you have questions about the services we offer? You can reach us by phone at (407) 494-4736 or you can fill in the form below.